Mark Sampson is one of the most celebrated comedians in South Africa and had rave reviews at the National Arts Festival in Grahamstown. Currently he is enjoying excellent reviews at the Montecasino in Johannesburg-Fourways. Do you think comedy works like therapy in tough times? Then this is the show for you! The Cape Town show "Feels Funny" is a comic exploration of the ups and downs of life. Mark recently turned 40 and this comedy is unlike every stand-up you have seen before Feels Funny is your chance to come and laugh at Mark’s mid-life crisis, happening live onstage. In this show he reflects on life, all the ups and downs from first love to last rites, dodging sharks and stroking whales along the way. 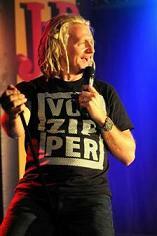 British Stand up comedian Mark Sampson landed in Cape Town years ago after coming here on surfing holidays and found that there was no stand-up comedy scene in Cape Town yet. With fellow founding members Marc Lottering and Stuart Taylor he founded the Cape Comedy Collective with workshops for young comedians in Cape Town in 1999 and finally put Cape Town on the map of the international Comedy scene. The comedian has traveled the world with his comedy shows and got rave reviews at many comedy festivals, like in Edinburgh, Berlin and Singapore. Since the show was first created, Mark has developed a lot of new material in "Feels Funny" following the ups and downs of Idols, the credit crunch, and a personal epiphany involving a skateboard, a ramp and a piece of hard tarmac - seven screws and one titanium plate later! 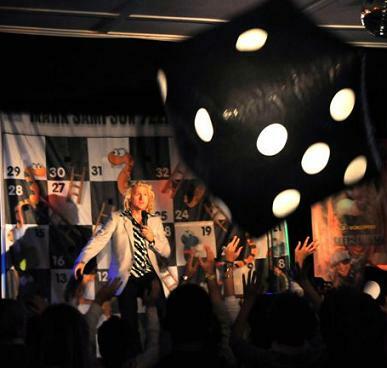 His unique comedy concept includes an outsized dice with which the audience directs the comedian and so every show has different turns. The use of a giant game of Snakes and Ladders contributes to more creative fun. Feels Funny not only teaches us how to cope during life’s downward cycles but actually proves that we can grow from adversity. How much? Prices from R100 either via Theatre on the Bay 021-438 3300 or via Computicket. Special offers for Seniors and group bookings. Do you want to read more about great Cape Town events and get the best Cape Town Insider Tips, then subscribe to my ExpatCapeTown Newsletter.